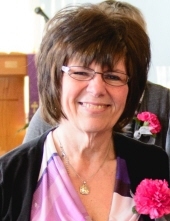 Carol L. Marheine, 61, of Eau Claire, passed away Sunday August 5, 2018 at Sacred Heart Hospital in Eau Claire. Carol was born in Eau Claire on May 13, 1957, the daughter of Alan and Mary Lou (Pavelski) Amundson. She married William Marheine July 10, 1982 at St. James the Greater Catholic Church in Eau Claire. Carol worked as an occupational therapy assistant at Sacred Heart Hospital for over 25 years. Family and friends were what Carol loved most in the world, especially her two granddaughters, Daphnie and Violet. She also enjoyed the outdoors, especially camping and fishing. Her recent trip to Montana to see her son, Jason, was something she was very excited about. She will be remembered for her great smile and laugh, as well as her dedication to her family. Survivors include her children, Jason Marheine of Montana and Jenny (Jeff) Stewart of Eau Claire; a brother, Richard (Barb) Amundson; a sister, MaryAnn (Wenzel) Smejkal; two grandchildren, Daphnie and Violet Stewart; as well as other relatives and many friends. She is preceded in death by her husband, Bill Marheine; her parents, Mary Lou and Don Pavelski and Alan Amundson; grandmother, Beatrice McCracken; brother, Don Pavelski Jr.; sister-in-law, Jenny Pavelski; mother-in-law, Arlene Marheine; and father-in-law, Albert (Kelly) Marheine. A Mass of Christian Burial will be held Thursday August 9, 2018 at St. James the Greater Catholic Church at 11:00 A.M. with Rev. Tom Krieg officiating. Interment will follow at Sacred Heart Cemetery, Eau Claire. Friends and family may call Wednesday from 4:00-7:00 P.M. at Stokes Prock & Mundt Funeral Chapel, Altoona and Thursday an hour before services at the church. "Email Address" would like to share the life celebration of Carol L. Marheine. Click on the "link" to go to share a favorite memory or leave a condolence message for the family.